When we first learned about Zapier, we were immediately excited. 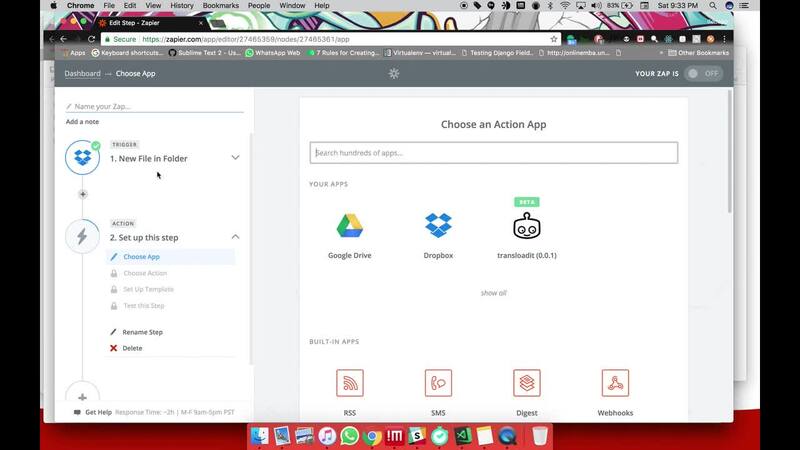 Zapier lets you take the output of one service (a newly received email, for instance) and then use that for the input of a second service (saving records in a Google sheet). It already allows you to do this for thousands of services. It is somewhat like IFTTT but for businesses, and one of the plus sides is that it does not require a phone to orchestrate. We think it's not a stretch to say that what Transloadit is to files, Zapier is to API services. And that likely explains why the power of Zapier resonates so much with our crew. As such, we felt it would make a lot of sense to add our service as well to Zapier's quickly growing catalogue. While currently still in private beta, we're already dog-fooding and enjoying tight integration of Transloadit with Dropbox, for instance. This means that you can save a new video to a Dropbox folder, and only a few minutes later, a transcoded version that's optimized for display on iPad gets added automatically. How about that! Of course, you can also run custom jobs on your files by passing a Template ID instead. This allows you to perform any of the vast list of file operations that are within Transloadit's arsenal on audio, video, images, documents or websites. 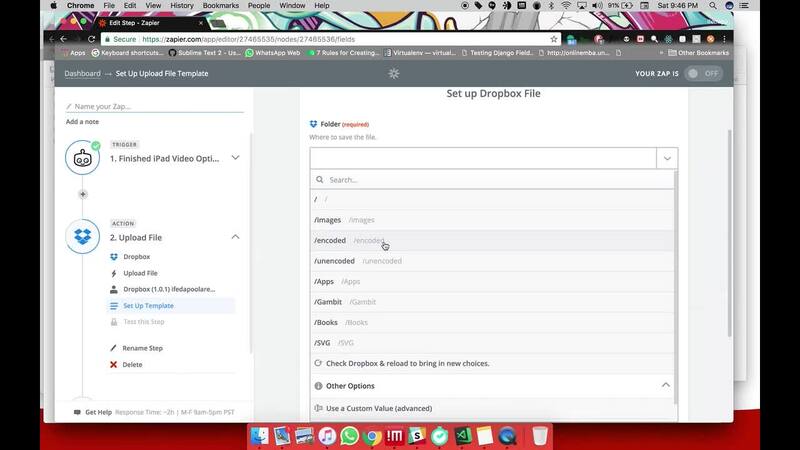 To help you get started, we put together two short step-by-step video walkthroughs on adding encoding capabilities to other services on Zapier. Under the hood, Assemblies are tagged with the originating Zap name. This makes it possible to create new Zaps with triggers on actions, such as: 'when the iPad conversion is ready -> message Slack'. Avoid Zap loops: in order to avoid Zap loops, be sure not to trigger Assembly actions in the same folder where your completed Templates files are received. In the case of Dropbox, use one folder for input, and a different one for output. For more information on this, see this Zapier help page. If you have issues with Dropbox and large files, check out: Missing Dropbox File field, in large files. Transloadit's encoding is non-blocking. If you want to pass a file from Dropbox to Transloadit, you can't use the results in consequential steps. Instead, you should create a second Zap as illustrated below. As of now, we are in private beta and hoping to get some testers as a result of this blog post. If you are interested, please click here for a free invite. And if you have any feedback, be sure to hit Reply on the Zapier thread in our brand new community forum!